Camping Devezeau is an English run Campsite in France offering the perfect Caravan & Camping holiday retreat, with Pool & Bar and Café. 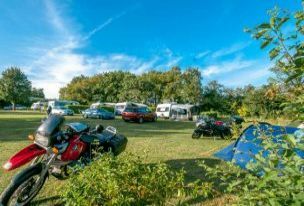 Set in the heart of the peaceful Charente countryside, our campsite is tranquil with many walks and cycle rides along quiet lanes and tracks. Conveniently located for good access via the N10, just north of the vibrant city of Angouleme. You can choose from 29 touring pitches, with some on hardstanding. We are able to accommodate all sizes of vehicles, from bicycles and tents to caravans and motorhomes (twin axle and large american fifth wheelers by appointment only). If you just wish to ‘chill out’, you can sit by the pool or in the Café Courtyard, go for a leisurely stroll into St. Angeau and for those of you looking for interest and culture we are within easy reach of Angouleme, Limoges, Cognac, Bordeaux, Futuroscope and even Royan on the West Coast. 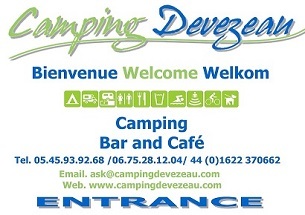 If you need anymore details or information, please contact us at ask@campingdevezeau.com We look forward to meeting you.